To scan and read this piece with your mobile phone you will need to download the software into your phone. For iPhones, see special instructions at bottom. 1. Go to http://get.qode.com in your handset's web browser, and follow the instructions at the web site. 2. Once the reader application is installed, start the program, aim your camera phone at the code and then take a photo by choosing click on your screen. Make sure to frame the barcode with plenty of white space or the reader will not decode the barcode correctly. 3. When the program has decoded the 2D barcode- click on continue, you will be directed to a website and my encoded text message will appear on the phone. Go to App Store search for Upcode and download. Follow directions on screen -Take picture, then click on Use photo. Make sure to frame the barcode with plenty of white space. 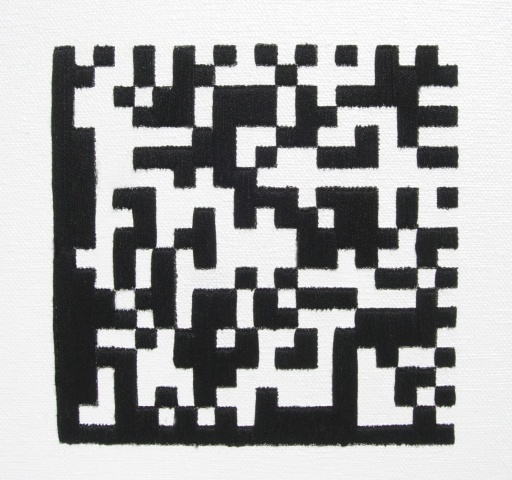 I chose to create an embroidered version of a barcode to represent how technology has become interwoven, fused with our lives and our identity- to represent how we have become one and the same with technology. Through new technology cell phones are now capable of scanning and decoding barcodes. However, these barcodes are a little different than the ones you see scanned at the grocery store: they are called 2D barcodes and are composed of black and white squares that encode the URLs to any website of creator's choice. In other words, these Data Matrix format barcodes are a physical hyperlink. Through my research I have learned how to create and program 2D barcodes with embedded text messages. I have also discovered that these barcodes can be reproduced in a variety of materials and are still capable of being scanned/read with a mobile phone.